After Monday's debacle, Rahul wasn't brazen enough to ask for a tip. But soon thereafter he started hinting. He started subtly on Tuesday morning: Do drivers in your country make a lot of money? We don't in India. By Tuesday afternoon he became more direct: Are you happy with the service? I didn't think I was supposed to tip the driver. I was told by someone at the office where I was working that I shouldn't tip the driver. I started tipping him, but then his behavior took a change in a direction that continues to baffle me. Due to restrictions on photography, this is the closest picture of the Akshardham temple I could get. He started really encouraging me to visit tourist spots. I can understand his willingness to take me anywhere if I asked, but he was suggesting. 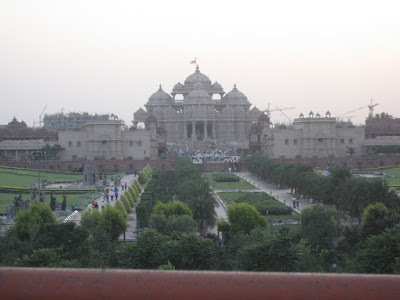 On Wednesday he took me to the Akshardham temple, and then to a restaurant for dinner. 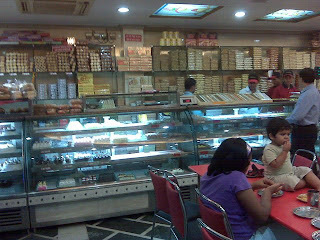 Half of the restaurant was dedicated to Indian sweets. At the restaurant he insisted on paying for my food. We argued back and forth on this matter for a while, before I finally communicated to him that I was going to pay for my own food. When I told my class about my night, they explained the first part (his eagerness to take me places) as he was likely being paid based on the mileage he drove each day. The only explanation for the second part (his eagerness to buy me dinner) was that he liked me. Gopi asked if we had a romantic dinner. I dismissed this theory based on the fact that one of the first things we talked about when we met was his family. Then again, that could have been a ruse, and not even a very well concocted one at that. He did claim to have a 1 year-old child and a 6 month-old child.